From Jawas to sandtroopers to droids, supporting characters get a chance to shine in a new Star Wars story collection. Titled Star Wars: From a Certain Point of View, the book boasts 40 original stories in honor of the franchise’s 40th anniversary. So if you’ve ever wondered why the trash compactor monster attacked Luke or how Admiral Motti reacted to being Force-choked by Darth Vader, this book has the answers. 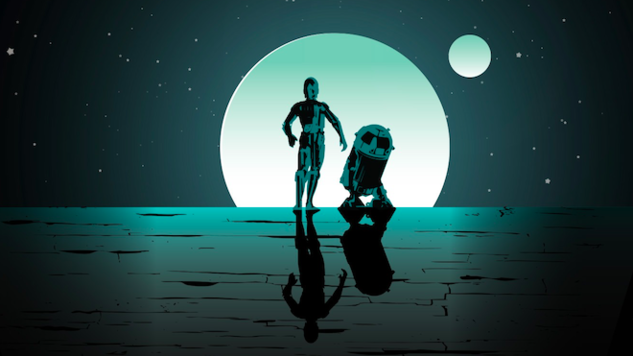 The book opens with events immediately preceding Episode IV and ends right after the film, so these diverse tales are perfect for anyone seeking some good ol’ nostalgia. And while the whole book is worth a read, these 10 tales are our favorites. Rucka’s heartbreaking story takes place during the Rebellion’s attack on the Death Star during Episode IV. It follows the brilliant Nera Kase, who listens to radio chatter as the pilots whose X-wings she maintains are killed. Nera’s narrative gives a voice to the Rebellion’s strength and grief, and this tale will stick with you long after the final page. This droid gets precious little screen time, but Carson’s story reveals him to be a Rebellion-supporting hero. You’ll fall in love with the brave, self-sacrificing droid, who finally gets the backstory he deserves. Written as a chapter excerpted from Ickabel G’ont’s tell-all memoir, this story reveals how the Bith band ended up on Tatooine. Lafferty’s creative storytelling gives us the gossip we’ve always wanted to hear about this talented group. Another character that gets mere seconds of screen time, Garindan tips off the Empire about the location of two significant droids on Tatooine. Dawson’s story gifts the character a rich history, leaving you wanting more information about the enigmatic spy. Were any officers injured during this incident? One can only hope. Ortberg also relays her story as an incident report, using a more freeform format laced with an officer’s controlled rage. Conan Antonio Motti, who is (understandably) upset after Darth Vader Force-chokes him, details the “incident” and calls out Vader for his “workplace proselytization.” You’ll love to hate Motti while reading this one. This collection boasts some inventive storytelling formats, but Weldon’s is hands down the most gloriously creative of the bunch. In listing the systems log from an MSE-6 droid nicknamed “G7,” Weldon introduces a secret romance between the droid’s stormtrooper owner and an Imperial officer. Who knew the galaxy’s fastest mouse droid would be a matchmaker? Arvira has got to be the most genius desk jockey in the Imperial Navy, creating paper trails that tell perfectly crafted (if untrue) stories to his superiors. In this case, he works to cover up a missing escape pod that might have housed the galaxy’s most wanted droids. It’s impossible to convey just how brilliantly Liu weaves this tale, so just take our word for it and read it yourself. Props to McElroy for writing the most endearing Jawa in the Star Wars canon. You’ll fall in love with Jot, an especially petite Jawa with his head in the clouds. Not only is Jot a sweetheart, but he also proves to be an unsung hero of the original trilogy. Out of the 40 stories in this collection, Okorafor’s “The Baptist” is the one that deserves to become a novel. This gorgeous narrative chronicles Omi’s journey from her home planet of Vodran to her enslavement aboard the Death Star to her interaction with Luke Skywalker. Okorafor writes Omi as a brave and spiritual warrior, breathing life into one of the galaxy’s most captivating characters. Check out this article to learn more about the collection and to see all of Chris Trevas’ silhouette artwork from the book.